I was first licensed as KAØDXG in 1979 and obtained my Extra Class ticket in 1981 as KMØT. In the early 80's, I operated quite a bit during sunspot cycle 21. I then graduated from high school in 1982, went to college, got a job, got married, bought a house and had a bunch of kids. I rarely operated after 1982 and 1983 up until mid November of 1998 when the Ham Radio bug bit me again! That's when I had some space to put up a few towers and some time to do some experimenting. In 1999, I got bitten by the VHF / UHF bug. This is where I spend the majority of my time. 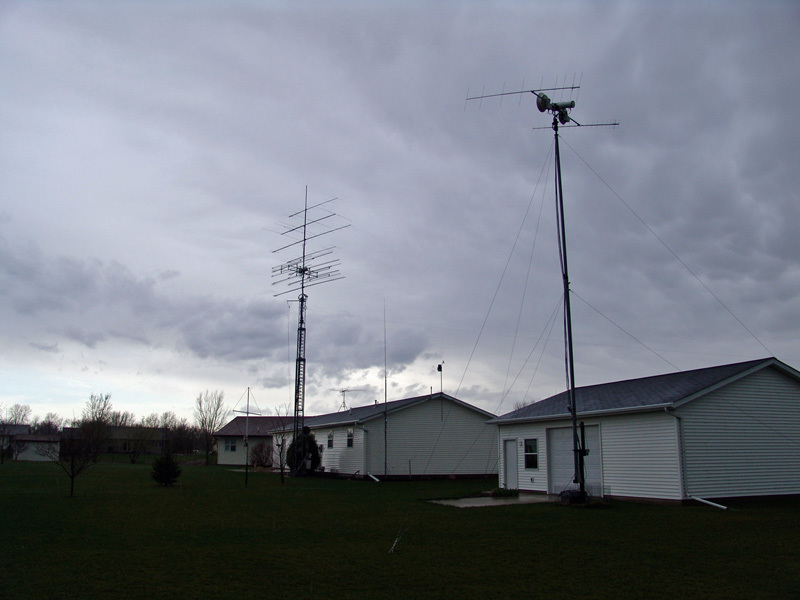 Since I began in February of 1999, I have been operating weak signal work on 50, 144, 222, 432, 902, 1296, 2304, 3456, 5760 and 10368 MHz SSB and CW. Very little HF, FM or repeater work here. I added the bands over time as I gained operating experience and technical know-how to put all this stuff together! I also assembled some portable systems for 24 GHz, where the microwave contacts can be pretty hard to pull off, but are very rewarding! I have worked tons of "Sporadic E" 6 meter openings and caught a bit of "DX". Working other countries on 6 Meters is very exciting as well as addicting! I finished my 6 Meter worked all states in a little over a years time. All with only 100 watts and 5 element Yagi Antenna. I still have a long way to go for 6M DXCC however. Time will tell. As of June of 2007, my 6 Meter country count is 77. 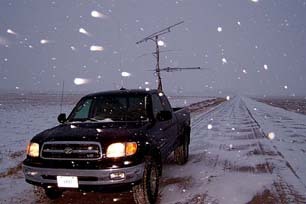 The 2001 / 2002 fall and winter was a great 6M DX season! 2003 gained a few more DXCC entities on multi-hop Sporadic Es. But 2004 was essentially a bust for DX from this part of the country. Due the the current solar sunspot cycle, DX on 6 Meters has been very slim. It looks like I will need to wait until the next sunspot peak around the year 2011 for the next F2 openings and hopefully I can finish my 6 Meter DXCC then! 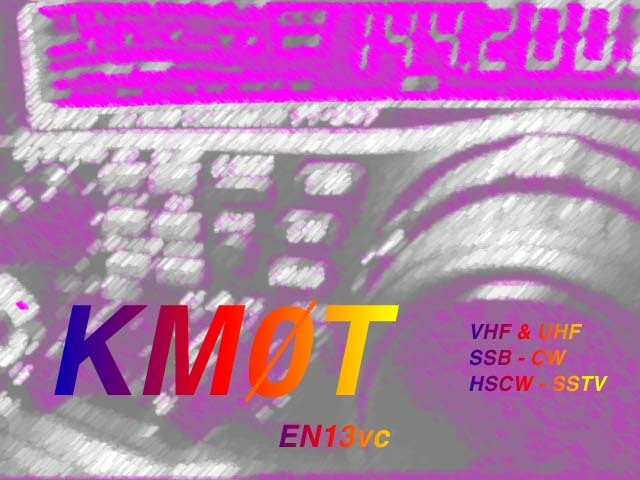 A little more history on KAØDXG / KMØT and Old QSL Cards! Check it out! GRID #20 on 24 GHz FALLS 5-2-2008! Gene - NØDQS and I had been watching the weather for the last few weeks, we knew we were running out of time. 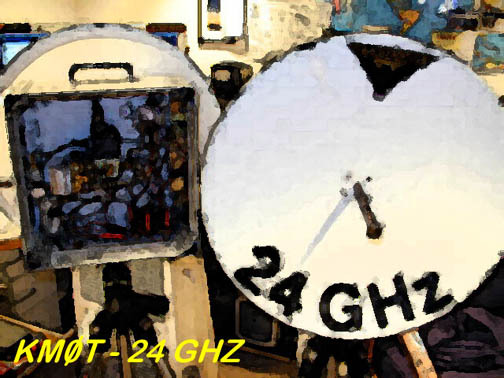 The weather was beginning to change over from cool and dry spring conditions to warm and humid conditions, not a good thing for 24 GHz operating. We saw that the forecast had slated cool to cold rain for May 1st and 2nd, so we figured this might be the last shot. On Thursday, May 1st, things stayed warm, windy and slightly humid. The cold was coming in, but no rain was generated in our area. 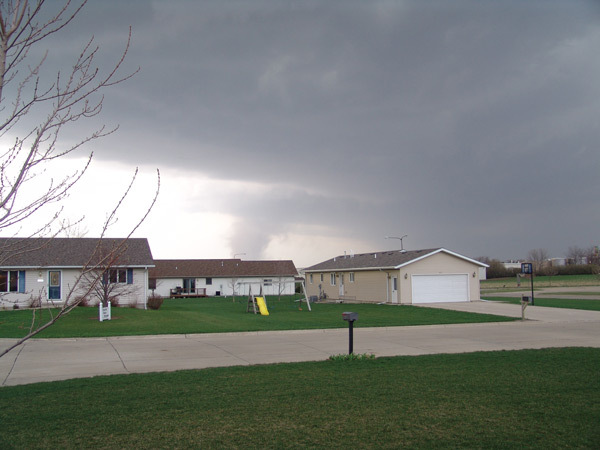 However, it was good enough here in NW Iowa to bring in the tornados! We had seven confirmed twisters within 30 miles of Sioux Center. In fact, one was just 5 miles west of town! I managed to get a bunch of pictures of it. Thankfully, the winds here only got up to about 40 MPH. The next day it started to rain and got quite a bit cooler. Gene and I talked around 10:00AM and he said he was getting ready to head out. The rain looked like it would be gone by the time he got to where he was going to setup in EN20hx. It was about a 2 hour drive for him, so I did some more work and then took the afternoon off to get setup. By the time I got home, the wind and rain was still in my area, but it had died off slightly. So I was able to get the microwave tower mast cranked up without too much binding on the tubes. I got it all running and tested, Gene was by then in position and getting set up as well. He however did not have any rain there, it had moved out of the area, but was still pretty windy. Again the rain had moved out farther than we had hoped. Gene - NØDQS with the GPS all setup in EN20hx. 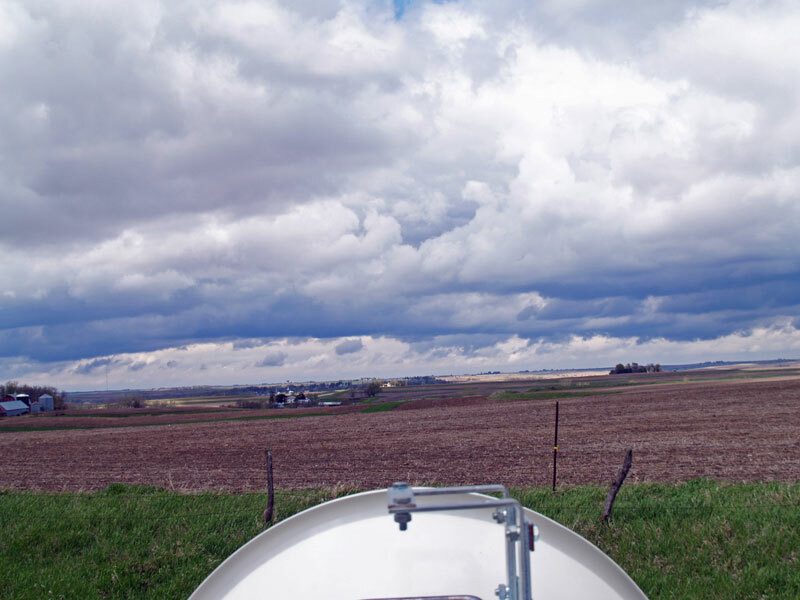 Dish setup, looks like the sun was trying to come out. Gene got set and started his beaconing. I listened for about 35 to 45 minutes with nothing on 24 GHz. 10 GHz signals were really good, and seemed to be peaking for me slightly off path. When my 10 GHz dish was brought to horizon, I pretty much lost the signal. As you can see from the radar, I was inside the rain again, and Gene was dry. Most of the path was also dry. We kept peaking on 10 GHz and then switching to 24 GHz. 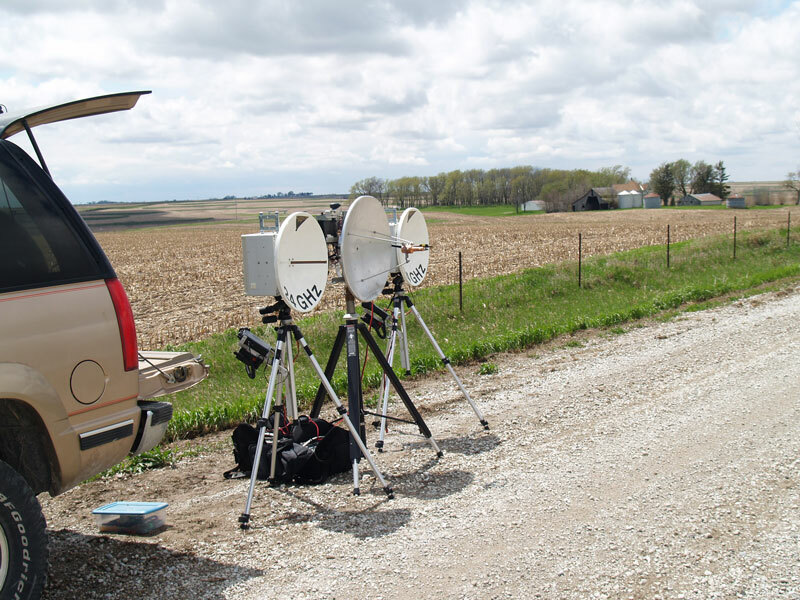 I would then sweep my 24 GHz system back and forth and up and down to see if I could see anything at all. With the wind and the rain here, I had my doubts. Talking to Gene on the other end, I had a hard time communicating due to the wind noise in his cell phone. Gene kept indicating that as we repeatedly re-peaked the 10 GHz dishes again, he was on the direct path as best as he could tell. 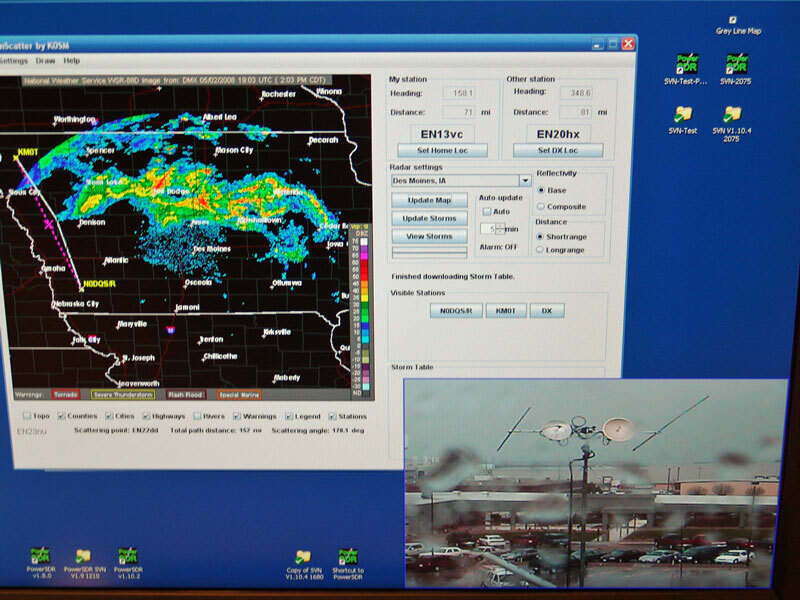 Rainscatter shot with Des Moines Radar. Note finger of rain out to the west of Denison Iowa. Radar shot from Sioux Falls, here you can see I'm very much in the rain. However, as frustration was setting in, I was busy looking over the radar screens and peeking every now and then at the SDR-1000 screen. At one point I did a double take on the SDR screen and saw a very weak waterfall on the very right edge of the panadapter. It was so close to the edge that I might have missed it. It was definitely a signal! I clicked on the waterfall signal and got things centered up in PowerSDR. If I had not had the waterfall turned on, it would have been very possible that I had never seen it, as the signal was just dBs above the baseline. It appeared that the problem was that I had not been tuning around enough. We had found that the inverter we were using to power the PTS-160 to drive the GPS locked signal source was causing lots of interference, so Gene had it turned off after the initial frequency calibration. Things must not have been warmed up or stabilized when he calibrated, because he was 10 KC high. I happened to have my SDR-1000 set on the 48 KHz sample rate, where it only shows + / - 10 KC. So that may have been much of the problem in initially finding him. However, we were not done by any means. Signals were weak and with QSB. Not as bad as the last time where we could not keep the antennas pointed on the scatter point for more then a few moments, but good enough where it took 15 minutes of going back and forth and peaking. 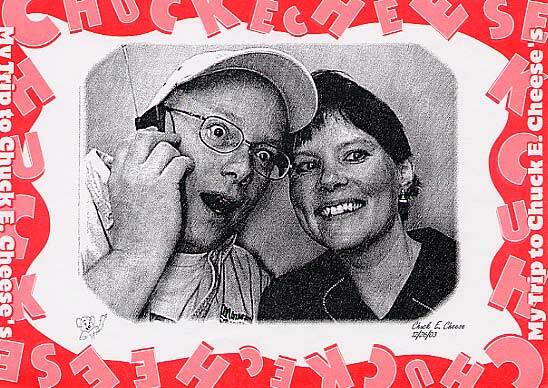 At one point we lost each other for a few minutes, and basically started all over again. At that point the path was different and seemed to be skewed to the east for me, and with considerable elevation on my end. The radar plots and SDR-1000 screen shots reflect that period. At times I lost the signal completely, and then it would come back. The loss of signal seemed to coincide with local heavier rain just at those times as I noted when looking at the tower camera shot and out the window here in the shack. PowerSDR with the Panadapter and Waterfall Display - Signals about 10 dB out of the noise, +/- QSB. Screen shot of PowerSDR with the peak function on...great weak signal detection tools in one package! When signals were as good as they got, I would say they were 519 with rainscatter quality. Gene reported weak signals but with tone most of the time. I would venture a guess that the widened out rainscatter portion of the signals were a few db lower than the pure tone, so they were not making it to him as the dry path to him was quite long, but we really can't explain it. EN13vc to EN20hx WinGrid distance was 152.8 miles, 245.9 km. 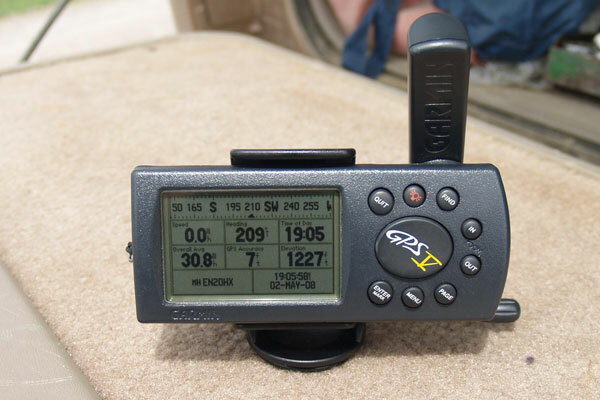 Logged time was 1904 UTC. showing the elevation on the microwave tower. Note the wet conditions. Elevation on the microwave tower, rain on the camera lens. Another shot showing the conditions and elevation. It was raining pretty good. The direct path was about 164 degrees for me. But that was not what was showing up on my rotor box. It showed 157 degrees. I left the tower as it was until the rain stopped and took my GPS outside. I walked a long distance in the direction of the pointed 24 GHz system and came up with 155 degrees. So I'm fairly certain that the direct path was not in play. I suspect the finger of rain coming out west of Denison Iowa was the key. The elevation to that point by looking at the geometry of the path somewhat makes sense. I would estimate that the elevation was 20 to 25 degrees. Note that the Rainscatter screen shot shows the path just to the edge of the finger of rain at 158 degrees. If I was indeed pointed at 155 degrees, then I would have been crossing that area. However, Gene said he was pointed on direct path, however if off a few degrees, or dish skew, etc, based on how far away he was from that reflection point, he might have been pointed there, we just don't know for sure. However, another theory is that since the rain was right on top of me with some yellow just south, I was probably coming off of that with maybe another hop west of Denison Iowa. That would explain perhaps why gene was running virtually no elevation there, but still does not explain his direct heading. It could be that there was rain farther west than what had been showing up on radar at that location. Another note, winds were 15 MPH and higher gusts here from the weather station. Gene estimated winds were 15 to 20 MPH there, pretty constant. Temps were 50 degrees on Genes side, no rain. Temp was 48 here in EN13 with 95% humidity and 47 degree dew point. Pretty high dew point, so I cant explain that either. I suspected that the dew points on the dry part of the path were lower. However, after checking a few spot along the dry portion of the path on the NOAA website, dew points were a consistent 48 degrees, temps varied slightly around 50 degrees. Grid 21 is not out of the question, just have to get to EN05! I want to thank Gene - NØDQS and Jon - WØZQ for going out and activating these grids. Without those efforts, 20 Grids would have been nothing but a dream! I had the easy end of things, as all I had to do was sit in the shack and wait for the signals to roll in! I'm positive that without the SDR-1000 IF radio, it would have not have happened. Thanks Flex-Radio! In addition, without the 3 Watt W2PED amplifiers, we would be a long ways from 20 grids! Thanks Paul! 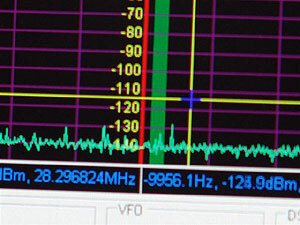 The SDR-1000 from Flex-Radio is being utilized at 28 MHz as the first IF for VHF and microwave use. 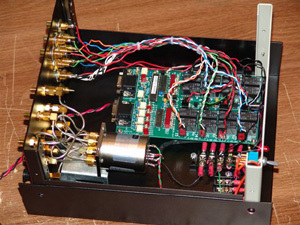 The bandscope function and implementation of the UCB (Universal Control Board) for IF Switching is AWESOME! Click Here for Details - We are 100% SDR! Click here for the VAC - WSJT Setup Overview! Results of KMØT - More than just contest results! Good stories too! 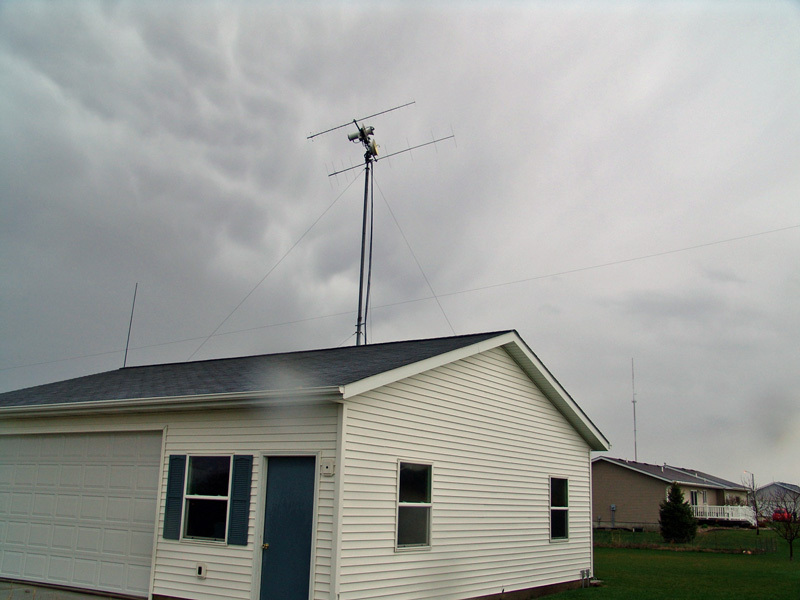 ARRL June 2005 VHF QSO Party - Shack Rebuild and SDR-1000 Smoke Test! 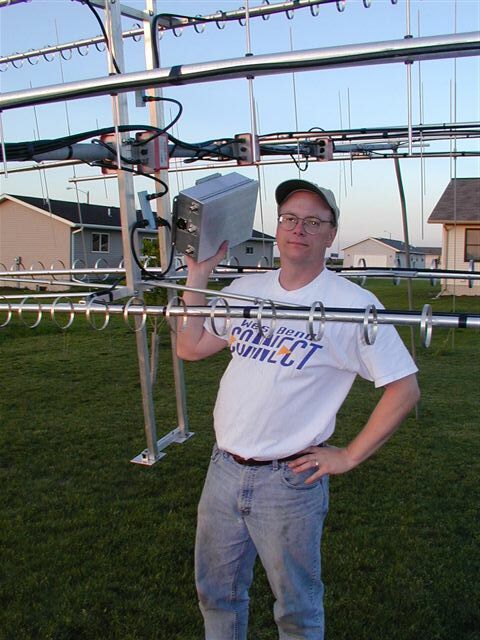 ARRL UHF Contest 2004 and "ROVER MANIA"!!!!! 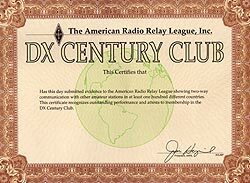 ARRL January 2004 VHF Sweepstakes and my first Rover Outing! 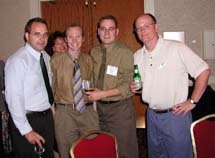 ARRL September VHF QSO Party 2003 and Rover City! ARRL June 2003 VHF QSO Party - Awesome 6 Meter Spectacular! ARRL September VHF QSO Party 2002 and IC-756 Pro II Transverter Interfacing! 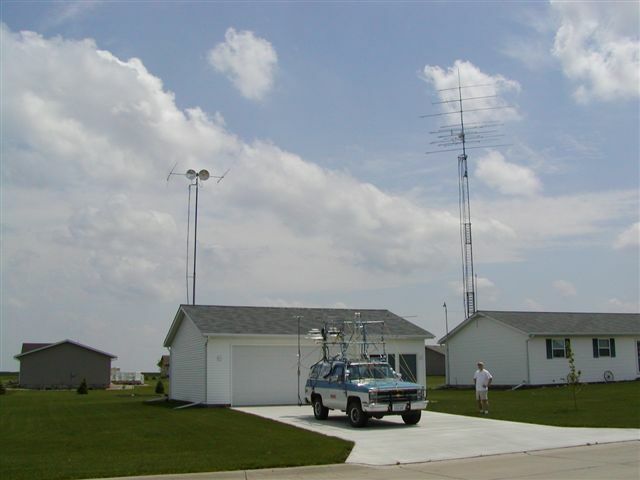 ARRL UHF Contest 2002 and the "Hybrid" 5.7 Rover Setup! 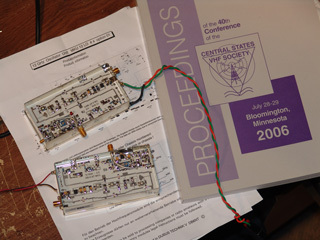 ARRL June 2002 VHF QSO Party with New Tower Project and a Stab at 5.7 and 10 GHz! 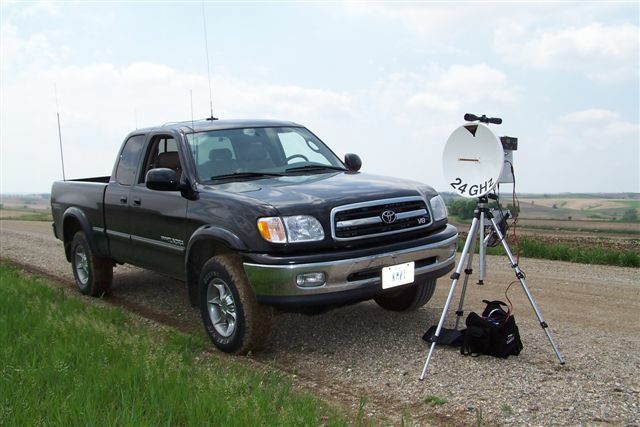 ARRL January 2002 VHF Sweepstakes - 6M F2 and Backscatter! 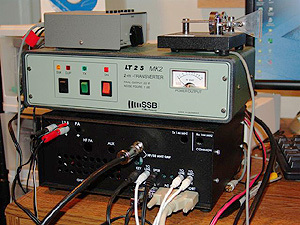 ARRL September VHF QSO Party 2001 and Transverter Maintenance! ARRL UHF Contest 2001 with mandatory cooking duty! "I'm missing what!! !...Eskip on 432??? ?.....But.....I'm out for pizza with the kids!" So, I hope you enjoy perusing the website. Its a work in progress as always and there are always better ways to show things and always more interesting content to add. This page was built with FrontPage 2003 and a bit of HTML direct editing. 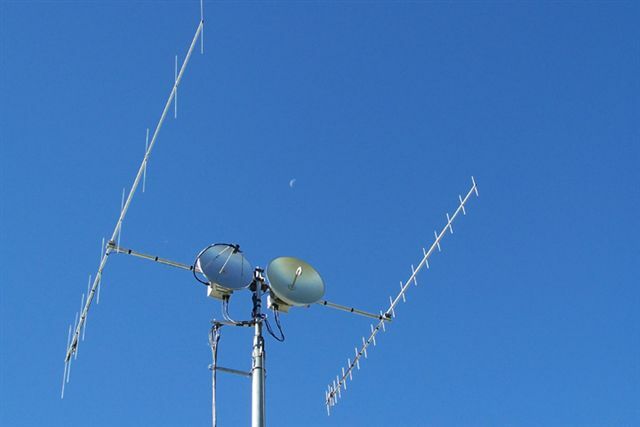 Good luck in Amateur Radio should you decide to pursue this fine hobby. It's not a bad thing to be called a "HAM"! Rover Setup - Could be fun! On Hold! 47 GHz - my wife is going to blow a gasket! - On Hold!